Enjoy extraordinary convenience while maintaining full control and security over your fuel, cash, and non-fuel purchases. Setting purchase limits in real-time through a robust, secure online website is the power behind the EFS fuel card. Flexible purchase limits give you the ability to customize at the individual card level. Control fuel and non-fuel purchases with distinct card prompts that validate the sale at the point of purchase, and, if you choose, a variety of pertinent data can be captured and validated before fueling is authorized. *Electronic Funds Source LLC (EFS) is not the program sponsor or operator of this fuel program and is not affiliated with [insert customer’s or program operator’s legal name]. 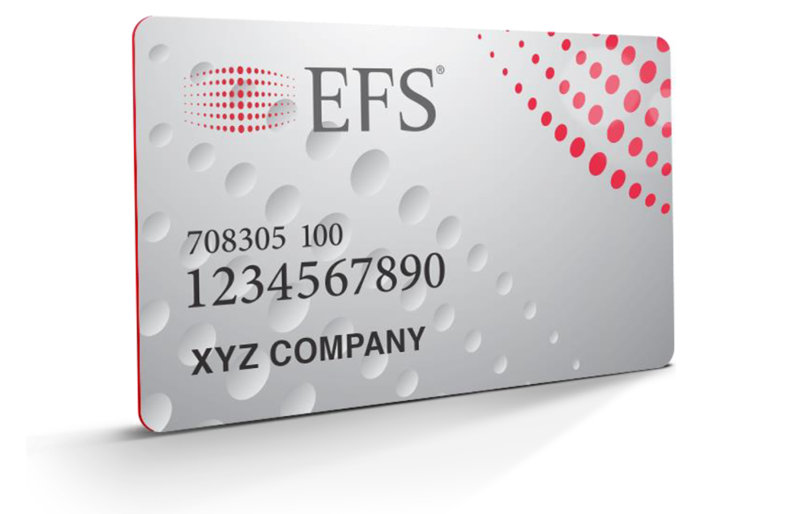 EFS is a third-party payment processing provider which provides processing services under the names Electronic Funds Source, EFS, TCH, T-Chek, T-Chek Systems, EFS Transportation Services, and EFSTS. Statements made about the Program are provided by the program operator and not EFS. ©2019 Electronic Funds Source LLC. All Rights Reserved. CDL Health creates a better, healthier livelihood for the people that move the world by providing valuable services to drivers, employers, and a nationwide network of CDL health providers. CDLHealth.com is a secure website that treats all data with the utmost sensitivity and maximum security. Our business only succeeds when gaining your trust, and full compliance with HIPAA security standards is achieved and continually maintained at every step. We encrypt all traffic at CDLHealth.com with 256 bit encryption with the help of a verified SSL certificate from a proven SSL certificate provider. We encrypt all sensitive data on the server so that only you and your health provider have access to your data. All mobile devices used by a health provider to access your data goes through extra security precautions to ensure it can be immediately wiped clean if it were to be misplaced. We value your feedback. Let us know what you think, and we'll work to make your experience the best possible one. We will try to follow up with you in a jiffy! CDL Health (CDLH) respects your Privacy. CDLH does not sell or give visitor information to third parties for the purpose of direct mail or spamming without visitor permission. However, the personal information you provide lets us inform you about updates to CDLH and, if you have elected to receive such information, the products and services of CDLH’s vendors who we believe may be of interest to you. Surveys and user Research. CDLH also conduct periodic e-mail and Web-delivered surveys to gather information about our audience. We share the aggregate results of these surveys - not individual data - with our vendors to help them better understand our Internet audience and monitor the reach of their advertising on our Web site. CDLH uses reasonable precautions to keep the personal information disclosed to us secure and to disclose such information only to third parties we believe to be responsible. However, we are not responsible for any breach of security or for any actions of any third parties that receive the information. Internet. CDLH does not rent, sell or exchange information about its customers. Access to customer information is limited to those employees who need it to carry out their business functions. CDLH collects personally identifiable information (such as name, address, telephone number or e-mail address) from Web site visitors only when visitors voluntarily provide such information. This information may be stores and used by CDLH to better understand its customers’ needs, to improve CDLH products and services, and to contact customers regarding offers that may be of interest to them. CDLH also collects information from web site visitors that is not personally identifiable such as the visitor’s operating system, browser, domain name, and the specific Web pages on the CDLH Web site that were visited. CDLH may implore the use of a ‘cookie’ or similar file to gather information that is not personally identifiable. READ THESE TERMS CAREFULLY BEFORE USING THIS SITE. By using this site you agree to these terms. If you do not agree to these terms, do not use this site. Copyright All site design, graphics, text and the selection and arrangement therof, and all software are Copyright© 2019, CDL Health. ALL RIGHTS RESERVED. Redistribution, retransmission, republication or commercial exploitation of these contents of this site is expressly prohibited without the consent of CDLH. CDLH IS PROVIDING THIS SITEAND ITS CONTENTS ON AN ‘AS IS’ BASIS AND MAKES NO REPRESENTATIONS OR WARRANTIES OF ANY KIND WITH RESPECT TO THIS SITE, ITS CONTENTS OR ANY SITE THAT IS LINKED HERETO. CDLH DISCLAIMS ALL SUCH REPRESENTATIONS AND WARRANTIES, INCLUDING, FOR EXAMPLE, WARRANTIES OF MERECHANTABILITY AND FITNESS FOR A PARTICULAR PURPOSE. IN ADDITION, CDLH DOES NOT REPRESENT OR WARRANT THAT THE INFORMATION ACCESSIBLE VIA THIS SITE OR ANY SITE LINKED HERETO IS ACCURATE, COMPLETE OR CURRENT. PRICE AND AVAILABILITY INFORMATION, AS WELL AS OTHER INFORMATION CONTAINED IN THIS SITE, IS SUBJECT TO CHANGE WITHOUT NOTICE. Arg! You're using a browser we no longer support. CDLHealth.com doesn't support Internet Explorer 6 or 7 (IE6 or IE7). Please use IE8 or greater, or check out Mozilla Firefox or Google Chrome. We apologize for any inconvenience, and are bummed if this causes a problem.